Club Penguin Cheats by Mimo777 Club Penguin Cheats by Mimo777: Club Penguin Fire Puffle BASEBALL shoes?! FAIL! 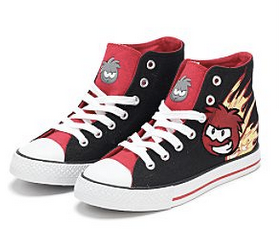 These Club Penguin Puffle Fire "Baseball" shoes are another strange item from the UK Disney online store. The reason this is a FAIL is because on what planet are these "baseball" shoes? LOL! Our Club Penguin baseball style shoes offer a blazing new look for summer. They combine a thick rubber sole and toe with a lightweight canvas upper, decorated with metallic character print and finished with chunky laces. Anyway, it looks like the UK Disney online store is kinda difficult to get to for those of us in the US. But the "official" Club Penguin items on that UK site are well, crappy at best. I am assuming they are real but still come on. What next? If you want to go there, click here. This is a cached version of the site. Hope it works for you. Umm... do they mean skateboarding shoes? 'Cuz they might look like those.. On MARS! :D I am a mega baseball fan and I cannot see how these r baseball... They're not cleats.. Very good! I really like them! MIMO! I got it! They say they're baseball LIKE shoes. Not real baseball shoes. LOL! Mimo, baseball shoes are natural in the UK, it's completely different to the US. You've got to understand there's a different system via the US. As well I agree it's a fail. the next thing after the oven mitts will be a aunt artic bobblehead! P.S. They should make Aunt Arctic Toilet Paper. JK! P.S. (again) Even though those tennis shoes or baseball shoes or whatever they are they're pretty cool. that's kinda... strange... weird... screwed up... and what the heck r BASEBALL SHOES?!?!?!?!?!?!?!?!?!?!?!?! don't get me wrong they're kinda cool, but why BASEBALL shoes? why not shoes? why not misshapen mittens... jk! Don't you think the design would be better on idk gloves? cause you know they're all warm and cozy and whatever. kinda... odd. You people have never heard of basketball shoes?? There are basketball shoes all over canada... unless you guys don't have them over there in the U.S. (or where ever you live) and they are LIKE basketball shoes! Arent they supposed to be basketball shoes? It would make way more sense! They look like converse high tops. "Chunky laces"...hahahahahah!MMMM yahhh I would SOO want those. RH OVEN MITTS? WOAHHHH NOW IF THEY DO THAT, disney will be FAIL. i agree with Loki Terry. Its like in us you guys say chips and we say crisps. WAIT! TAKE BACK WHAT I SAID! BASEBALL?? THERE'S NO SUCH THING AS BASEBALL SHOES! FAIL! Dude/Dudette, Aunt Arctic toilet paper would be so weird...What you really want is Penguin Band diapers! Rock hopper oven mitts; Just might work ;D P.S Can you show me the other crappy items? way to have an attitude. WAIT! We do have baseball shoes in Canada but they are still uncommon... slthough this post was kinda harsh to the people in the UK who think of baseball shoes as regular things... don't you think? Yeah.. please do not put (CPG MOD) when you are not modding. Thanks! Yeah, me too... they are not baseball shoes.. Club Penguin messed up BIG TIME! Mimo, that's really offensive to me. I live in England. But... I can tell you something secret, Disney Store never update there site but they have everything America has! I hope this secret helped!! Mimo! Cheat for you!!! When you wear the recorder from backstage and wave, you record!!! How awesome is that?? Please give me credit. Thanks! mimo, to be honest, u wouldent really wanna wear those at school would you LOL! Yeh Mars people would defiantely wear them lol! (Mars person comes on, talks to Kkkkkk123) He's just told me that at this planet he doesn't wear them so I guess maybe Pluto, Venus or maybe Mimo777 planet of the warped dudes. (Pluto people, Venus people and Mimo777 planet of the warped dudes dudes come on and talk to Kk) Nope we have had an intergalactic talk and no one would wear these from their planets...Except maybe Mimo...Hey Mimo you could say if I have over 1000 comments then I will buy and wear this and make a video, plus then sell it on ebay for a good price...BARGAIN! I know! These are offensive to me, even though I live in the US, but I LIVE baseball, so these are disapointing..
Just so you know those shoes aren't for playing baseball in. In the UK we don't play it...Duh?!?! Whats up with club penguin!? Its a game not a clothing factory! not everyone has the same thinking you may like it and others may not! lolz umm let me think what would be next...puffle soccer ball? UK English does translate weirdly for Americans. They actually look a teeny bit cool... but there are TWO problems: Who the heck wears Club Penguin SHOES? Also, like you said, those are NOT baseball shoes! It's like... nonsports baseball shoes! Sorry this is totaly random, I wasnt excatly sure where to post this.. How do you become a mod? Are you supposed to ask? lol. :D Sorry if its a stupid question.. I wouldn't even want my penguin wearing those... Those... "shoes". I'm not really a mod, I have tried, but I keep failing.As much as I wanna add Mimo, I'll win a contest or something (hopefully) but anyways, yeah, Mimo said crappy. SO what! He's not a 10 year old! I say it all the time! Sure I don't post it, but I might everery once and a while! Mimo! !theres new Club Penguin Post cards! theres one for "Tip the berg"! idk if you posted yet. Who wants to buy a club penguin shoes anyway? FAIL! I agree they are a failure like most of the other cool penguins! I live in the UK and have 20 club penguin items all purchased from the disney store but will definately not be buying them! I am going to disneyland florida in 2 weeksso can not wait to get some more CP toys! the UK and UK cp site is just as good as US though!? I have never said or wrote that word before...I've never sworn either. I'm proud of myself! The UK is not stupid O.K.? We have won more wars then America and that's a fact. We ruled lot's of the world anyway. In WW2 we won even though Americans didn't help, we were up against Germany. A much bigger counrty then us! So promise me one thing. Never say the UK is stupid. No question is a stupid one! To become a mod, just answer peoples questions, and comment on their comments.! Once you do that, sigh off as "Reagh Reagh (CPG Mod)" If you keep that up for a while, you will become a mod! First of all, Mimo is a human too, so he has to be normal, and say stuff. Secondly, you spelt break wrong, give him a BREAK... Sorry, I am a perfectionest! lol they look weird, but i like the black puffle pic! Hehe..ya i wouldnt wear that to school! i would be soo embarrassed. OMG! Those r soooooooooo UGLY!!! mimo i live in the Uk and i think there fine so stop saying the Uk site is bad! They are NOT baseball shoes, and definitely not skateboard shoes. They are converse. Lol! I was just kidding! I like them too, just, baseball shoes? Not really. And congratz for wiening the What's Different contest! Yeah it would make more sense. They look more like basketball shoes, but the store says their baseball shoes. LOL! idk why they think converse can be baseball shoes. Silly silly silly. You've never ehard of baseball shoes?! You obvously now nothing about kicks, lol. They look more like converse. My bday is today woo hoo!!!!!!! Mimo in UK baseball is called Soccer ok so you might wanna change it but anyways funny post. Hi Mimo!I love your blog!Just wanted to let you know,that loads of us in the UK call these pumps.They are quite popular over here.Plus sometimes people just use sports names as a way of saying trainers or (i think in america) sneakers. Back when Chucks first came out, they *were* basketball shoes. My mom has pictures in her yearbook of her on the basketball team, wearing orange ones. Since these are almost definetly not associated with Chuck Taylor or Converse in any way, they can't call them Converses, even though they're the same thing. So, basketball shoes it is. Usually you're pretty good about these things, Mimo...but I'd say you should do a little research! basball shoes, i have 2 or 3, they hurt my feet, i hate them! but ur the one that is rong just because you don't have baseball shoes in ur country doesn't mean that it is stupid and took me 6 hrs to figure out what a faucet is, in the uk it's called a tap! Thats phunnie 'cause baseball shoes are called cleats and cleats have little spikes on the bottom of them ya so that wired lol. Happy Bday! On mine, I'm not kidding, I met Mimo! Or at least saw him. So maybe you will! In Canada it's called a googaslime box! No, it's called a slimerwoop. No, it's called a tap... and a faucet... and I don't even know why I'm bothering to post this. It happens alright! It happened to my friend once! Rockhopper oven mitts would be awesome! Mimo I think that you should make a public blog apology because you said the dreaded "C" word! My Friend: "Hey, nice converse"
Me: "Errr... they're not converse, they're baseball shoes"
You know, your not even supposed to play baseball with them. xP They regular shoes. Ok that is not even true!!!!!! The US help England out in WW2!!!!! Give him a break!!! He wasn't trying to offend anyone! I don't even live in the US!! It's not nice of u guys to be mean to him. He is trying! And Crappy or Crap isn't even a bad word. It's like saying darn it or sucky!! We get it if Mimo doesn't know about UK culture! He doesn't live there! I bet none of u UK people no anything about the US! those are converses, (converses= not basbeall shoes) and anyone over the age of five would not where those. Lol, looks like a fancy pair of converse :D I would get them, if it didn't have anything CP on it.. shoes with CP stuff is a little geeky to me. I like them but I wouldn't wear them. Plus I don't live in the UK. Guys, remember, this is not a place to fight over countries. This is a CLUB PENGUIN blog site. Sheesh! I'm sure Mimo didn't mean to offend anyone in the UK. Most of us Americans don't know what type of shoes Britians call baseball shoes. The US and UK are different, and sell different things, and call them different names. So please, stop fighting, alright? Thank you. ----------------------------------- I agree.Soccer is football in the us baseball is baseball. And then they're will be pineapples that have penguin's eyes on them :O.
Mmmm pinaple. Try oranges with viking hats! Good for you! I have never sworn aloud before. That word isn't nessesarily a swear, but it is a term I would rather not use. arent base ball shoes cleats? club penguin really messed up! Um...those are nice but...WHO WHOULD WEAR THEM! Lol! You have it totally wrong. In the UK, we don't have Baseball, Cricket is probably the UK equivalent of Baseball. What you Americans call Soccer, we in the UK have always called Football, from before you Americans created American Football, which is totally different. Tjuan1011(CPG MOD)in training Waddle On!! Baseball? They look like Converse to me. i love your cheats they rock! When are you going to have a party?